Aristotle (384-322 BC) was perhaps the most important and influential philosopher of the ancient world, whose philosophical and theological works were commentated in the Middle Ages by the Arabian philosopher Averroes (1126-1198), who advocated the principle of twofold truth: religion, he said, is for the uneducated multitude, while philosophy is for the chosen few. 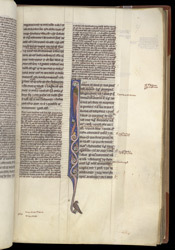 This manuscript contains evidence of several former owners, including the library at Rochester Cathedral. This initial 'I' marks the start of Book IV of the Metaphysics. The artist may have had a particular interest in birds, as he represents various kinds throughout this book. Here a naturalistic bird of prey perches on its lowest extremity.